You say "I read some articles online that during the 18th century some famille rose designs and makers mark are above the glaze." During the heyday of exquisite rose enamel (made from colloidal gold) work in extremely fine Imperial porcelains, some incomparable items were indeed reign-marked in overglaze rose enamel. These wares were almost all decorated in styles highly influenced by European wares (it was the Jesuits who supplied the technical know-how and possibly, in the beginning, some of the ingredients for this enamel). These wares were just perfection, and are extremely rare. Even though your plate is fairly well decorated, if compared side-by-side with the above-described items, yours would seem sloppy. 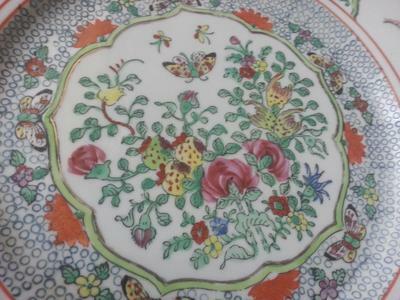 You would never mistake painted and stamped orange-red (iron-red) marks for the genuine overglaze rose, if you were to see a good image or real example. I also was thinking about that also, but I just wanted a professional point of view. Thank you so much once again. This looks like a modern piece. 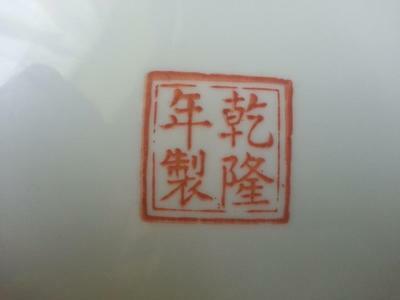 The Qianlong mark is only for decoration. It isn't a fake either as it is too obvious. When you look at the decoration of small circles you will see that they were transfered unto the plate in batches. 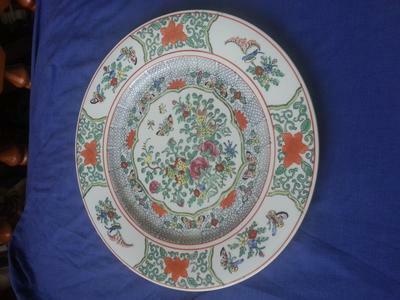 With 18th or 19th century Chinese plates they would have been painted on one by one.